secret cinema – The Nuge. Secret Cinema has, over the past decade or so, pioneered the concept of “live cinema”, transforming film into a uniquely dynamic performance, and encouraging thousands of punters to hand over cash without ever knowing what film they were going to see. It plunges film fans into a live interactive theatre space, directly relevant to forthcoming film screening, and elevates the experience of watching a film beyond slumping in front of a DVD. The people behind it, Future Cinema, have been branching out with further events, and this latest line on their increasingly impressive CV is ideal for those who don’t like surprises. Future Cinema presents Casablanca removes the element of mystery but retains most of the winning Secret Cinema formula. Like Secret Cinema, there is an element of playful participation, inviting us not to be passive observers but active contributors to the event. Weeks before, I receive an email from ‘Rick’, giving details of the location and dress code – a white tuxedo or trenchcoat is encouraged; I’m relieved that I at least made the effort to slap on a shirt and tie on the day as there are some seriously well-dressed couples in the queue. 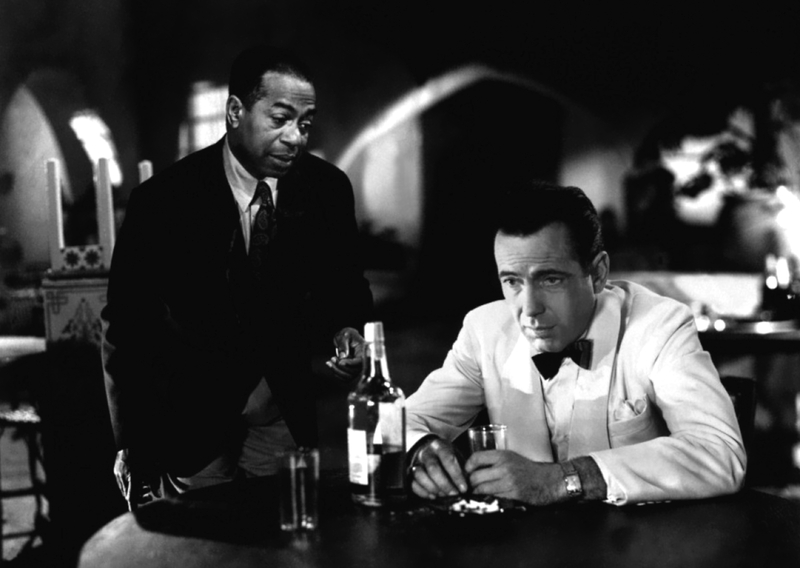 (And it is mostly couples – Casablanca is a canny choice around Valentine’s Day). Those foolish enough not suit up, or who do not have the correct ‘papers’, are pulled from the line and berated by actors dressed as soldiers from 1940s French Morocco. Once we get past ‘security’, we make our way inside, and it’s a little like stepping back in time to the 1940s, give or take a few camera phones. We’re in ‘Rick’s Café Americain’, a faithful recreation of the famous film setting, well-suited to the Troxy’s authentic art deco interior. A smartly-dressed band play some jazz and swing standards (including songs featured in the film, like ‘Knock On Wood’). Dancers in tiny sequinned dresses accompany them on stage with a Lindy Hop. Sam is there, in his fedora, and he does indeed play it again, on a jangly old piano. A few patrons are trying their luck at a casino, where occasionally a cheer will go up from the roulette table. As with all of Future Cinema’s events, the attention to detail is tremendous, and the effect is entirely immersive. This particular event feels more relaxed than previous Secret Cinema outings – the last season, which screened The Shawshank Redemption, had filmgoers dressed up in prison gear and thrown into cells for insubordination. The lack of surprise and a classier setting made this more like a jolly evening out, albeit one punctuated by actors fighting and shooting prop guns at each other. There was no prison slop here: we sipped elegant cocktails and ate delicious Moroccan food from Exmouth Market’s Moro restaurant. And then, after nearly three hours of chic live music and snippets of theatre, we sat down at the lampshaded tables and watched Casablanca. The confirmed classic has lost none of sits wistful romantic muster, and indeed is only enhanced by the surroundings. You can practically hear the sound of a thousand hearts ache by the time Bogart’s “hill of beans” speech rolls around. That this run has just been extended is no accident. We’ve said it before: you won’t find a better filmgoing experience in London. Future Cinema presents Casablanca runs until March 23rd. I’m standing in a queue and a smartly-dressed woman approaches me with a clipboard. “Are you a data scientist?” she asks. Yes, I reply. “Oh, you must be our specialist in Sumerian and Assyrian archaeology!” she adds, without missing a beat. I answer in the affirmative, and we engage in a lengthy conversation about my celebrated dissertation on Mesopotamian ziggurats. Then I am given a uniform, put through decontamination, and have my money changed into plastic discs. Then I board a spaceship. This would be an unusual scenario on any day for someone like me whose highest scientific qualification is a B in GCSE Double Science, and stranger still that it would take place in a cinema queue (an environment not known for conversations of grave academic importance). But this is Secret Cinema: where strange and wonderful encounters like this are business as usual. Every few months these pioneers of alternative cinema programming put on epic themed events each more quixotically ambitious and stupidly entertaining than the last. They’ve had Lawrence of Arabia with bedouins and actual camels, Bugsy Malone with custard pie fights, and One Flew Over the Cuckoo’s Nest in a hospital. Last Christmas, post-war Vienna was recreated in a four-storey warehouse to mimic the world of Carol Reed’s The Third Man. Any reviews of the current run must be shrouded in smokescreen, in order to comply with Secret Cinema’s ‘Tell No One’ policy. But plenty of cryptic clues are already out there: mailing list subscribers were invited to sign up to an ‘expedition’ with an organisation calling itself ‘Brave New Ventures’, with references to ‘psychological training’, and ‘discovering new worlds’. And it’s these new worlds that we discover in an enormous disused-building-turned-spaceship, near Euston in central London. Following ‘decontamination’, we are ushered into lines based on our supposed professions (as well as data scientists, audience members are assigned to be ore surveyors, matter analysts, containment officers and control stabilisers). Then, as lights flash, sirens thunder, and launch countdowns blare from loudspeakers, the pod doors open and we ‘board’. We’re free to mill about in our pretend space uniforms, exploring the rooms which include a plant nursery, a games room, and a science laboratory, where we have tremendous fun pretending to be knowledgeable lab technicians. A sizable cast of actors are always close by, encouraging you to lose yourself in the experience, and I spend some time discussing my research whilst surveying the surface of Venus. Then, following some time in ‘hypersleep’, we are led into the ‘loading bay’, where what appears to be two gigantic (and apparently genuine) props from the film greets us. It’s perhaps the most impressive – and probably most expensive – part of the whole evening. Suddenly I find myself scurrying around a desolate, unearthly landscape in near total darkness, searching for lab samples. I have to remind myself that all of this is not actually real. After a couple of hours of larking about pretending, the attending crowd of hundreds are shepherded into a chaotic ‘evacuation’. A deafening alarm sounds. Actors run through the crowd screaming in panic. I spot a couple of corpses. The staged sense of anxiety feels curiously real. Then, finally, we sit down to watch the secret film. And it is marvellous. Little wonder, then, that audiences have been coming in droves to Secret Cinema – it’s just about the most fun it is possible to have in London. The evening could only have been improved by marginally less time spent queuing. Is it possible to give a better recommendation than that? UPDATE (02/07/12): Since the current run is finished, we’re now allowed to say what the film was: PROMETHEUS. And the props mentioned were the actual space cruisers used in the film. How cool is that? I’ll tell you – very. This video just released from the Secret Cinema people – starring Allison Brie from Community, it seems – gives you a decent idea of how properly spectacular an evening it was. I can’t wait for the next one.